RETS Connector can execute tasks automatically. 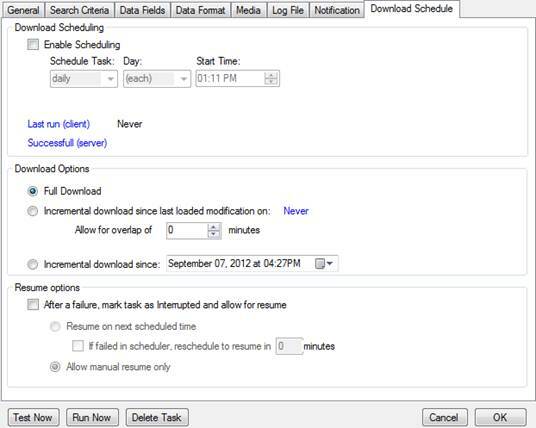 You can configure automatic downloads in step 9 of the Create New Task procedure, or from the Download Schedule tab when modifying a task (see Modifying an Existing Task). 1. Select the Enable Scheduling checkbox. 2. Select a frequency option from the Schedule Task dropdown menu. 3. Select a day option from the Day dropdown menu. 4. Specify a start time using the Start Time arrows. • Full Download. Downloads all records that match the search criteria. • Incremental download since last loaded modification on. Downloads only those records with a timestamp field that has changed since the last successful download. You can specify which timestamp field to use from the Incremental modification field dropdown menu on the General tab. • Incremental download since. Downloads only those records with a timestamp field that has changed since the specified date. You can specify which timestamp field to use from the Incremental modification field dropdown menu on the General tab (see General Tab). 6. Select a resume option (see Resuming Failed Scheduled Tasks).